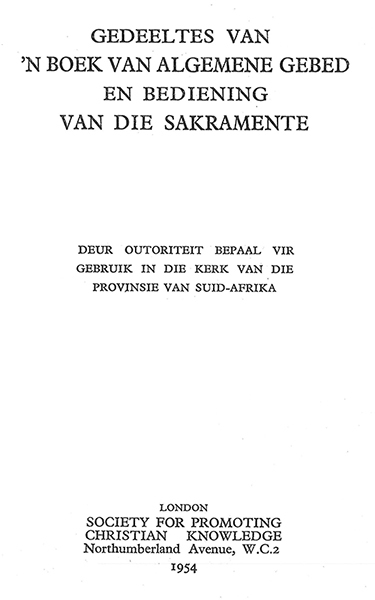 Gedeeltes van ʼn Boek van Algemene Gebed en Bediening van die Sakramente deur Outoriteit Bepaal vir Gebruik in die Kerk van die Provinsie van Suid-Afrika. Portions of the Book of Common Prayer in Afrikaans. London: Society for Promoting Christian Knowledge, 1954. Download in portable document format [ MB]. This translation of portions of the Book of Common Prayer into Afrikaans was published for use in the Church of the Province of South Africa. The Calendar includes a significantly enriched number of Anglican and specifically African commemorations not in the 1662 Book of Common Prayer: William Laud, George Herbert, Thomas Ken, John Keble, William Law, George Augustus Selwyn, the Martyrs of Uganda, Bernard Mizeki, William Wilberforce, Robert Gray, John Coleridge Patteson, Lancelot Andrewes, Henry Martyn, Alfred the Great, James Hannington, Charles Simeon, and Nicholas Ferrar. The State Prayers include intercessions for Elizabeth II as Queen of South Africa (the office was abolished in 1961). This text is identified as No. 84:3 in David Griffiths's Bibliography of the Book of Common Prayer 1549-1999 (London: The British Library; New Castle, Delaware: Oak Knoll Press, 2002). It was digitized in 2018 by Richard Mammana from a personal copy.